We have a large collection of 440 different types of Chinese Recipes. Yes, it's clearly evident that different types of Chinese Food recipes are super popular all across our lovely country. Chinese cuisine is a zesty one, with colorful and crunchy veggies, tongue-tickling sweet-and-sour notes and spicy flavors. It is much-loved by the Indians, so much so that all over India we can find several customized versions of Indian dishes using Chinese seasonings and sauces, as well as Chinese recipes using a dash of Indian spices and ingredients! This band of Chinese Recipes can well be called Indo-Chinese cuisine. We will find most authentic Chinese dishes, as well as a few adapted or Indianised versions of Chinese recipes in this section. If you master basic Chinese recipes on cooking rice/ noodles, making wonton wrappers or crispy rice then you can make an array of Oriental delights with the help of them. Chinese recipes use a lot of ingredients like garlic, ginger and spring onions, as well as sauces like soy sauce, vinegar and chili sauce, which instantly pep up the flavor of the whole dish. Apart from the basic sauces, Schezuan sauce, Hot Garlic Sauce, Chilli Garlic Sauce are popular Chinese accompaniments served with delicacies like wontons, Creamed Corn Cake, Sesame Paneer. You can even toss in vegetables to make amazing Chinese Stir-fries. They are quick to cook and makes use of unimaginable vegetables to create lip-smacking dishes. Make this Sautéed Snow Peas and Bean Sprouts, a combination of mildly sweet snow peas with succulent textured bean sprouts tossed in soy sauce and sesame seeds. Also, you can mix together an assortment of vegetables and make 8 Treasure Vegetables, a nutritious and tasty preparation made of any combination of eight colorful, fresh vegetables. You will also find corn flour and Maida used in several recipes for coating deep-fried appetizers or as a thickening agent for the soups and gravies like in Sweet Corn and Vegetable Soup, Veg Manchurian. Looking for a light yet satiating meal? Then you can go for Chinese mini meals like Chinese Pav Bhaji or Vegetable Manchurian Roll that are not only a treat to your taste buds but also, time-pinching. Dragon Rolls, Fried Wontons, Crispy Fried Vegetables with Burnt Garlic are popular Chinese starters that feature on restaurant menu cards. Paneer Parcels, Vegetable, Paneer and Noodle Balls are delectable Chinese starters made by combining soft, mellow paneer with zingy sauces. If you are looking for some steamed appetizing snacks then this Vegetable Dimsum and Water Chestnut and Bell Pepper Bao is something you must try! Bao is a type of steamed bun, which is very popular in Chinese cuisine. 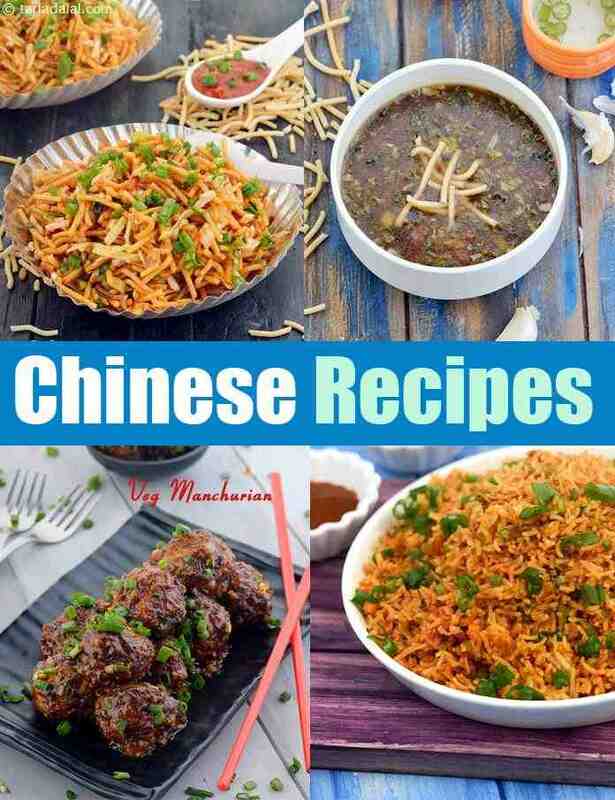 Discover top Chinese dishes Chinese Noodles, Chinese Rice dishes that can be served along with Chinese vegetables, from the much loved Schezuan Noodles, Vegetable Fried Rice, Steamed Wontons, Veg Crispy, and Veg Manchurian to lesser-known delights. Artificially colored, greasy, spicy plates of Chinese Bhel, Dry Manchurian balls, Soya Chili are famous Indo-Chinese street food preferred by most college going students. Also, they prefer Indo-Chinese food from roadside stalls because the quantity is humongous for the price they pay but, this is often unhealthy and contains a large amount of MSG. We hope our Chinese Veg Recipes would help you create authentic Chinese and Indo-Chinese food at home that is MSG-free!! After all the spicy treats, sooth your palate with some Chinese desserts. Unlike Indian sweets that makes use of a lot of ghee and sugar, Chinese desserts make use of honey and nuts like sesame and peanuts. Enjoy our collection of Chinese Recipes and Chinese Food articles below.